So anyway, thanks to Roaccutane, my skin has been rather flaky and dry lately, especially around the nose/mouth. And foaming cleansers that leave my skin feeling tight and squeaky are definitely not doing the job for me now. Quite by a combination of coincidence and good fortune, Shu Uemura sent over their newest product: the updated version of the A/O Skin Purifier Cleansing Oil, now known as the Anti/Oxi Skin Refining Anti-Dullness Cleansing Oil! 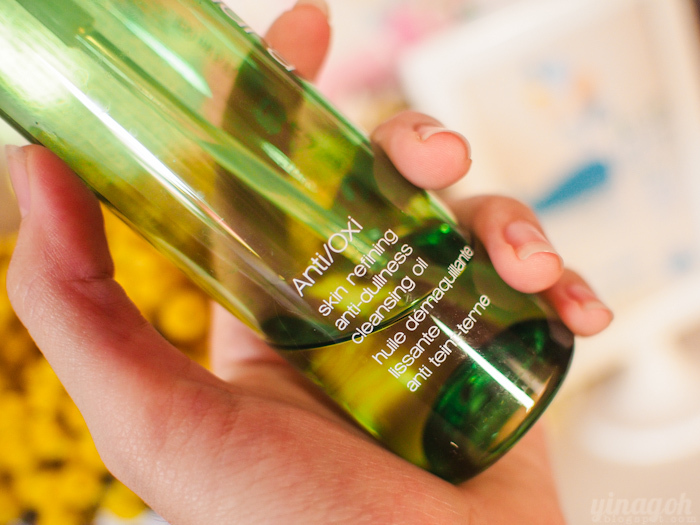 I have to say that I was worried about using the Shu Uemura Anti/Oxi Cleansing Oil at first. For someone who’s just recovered from a bad breakout, I was extremely apprehensive. I was worried that using oil to cleanse would clog my pores and cause further breakouts. Previous cleansing oils I used always felt just a little too thick and greasy on my skin, and I wasn’t sure if they were really working their magic, like so many people who swear by cleansing oils claim. I just never fell in love with them, nor did I ever re-purchase any of the previous cleansing oils I tried. But because Evonne was just raving and raving about the Shu Uemura Anti-Oxi Cleansing Oil, I thought to myself, okaaaaaay, I’ll just give it a try… and see how it works for me. 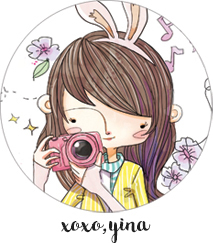 Two main ingredients are Moringa extract, and Green Tea extract. properties to help revitalize skin appearance. Find out more on Shu Uemura’s website here! The amazing powers of the Anti/Oxi Cleansing Oil are demonstrated in this charcoal cleansing experiment here: See what happens when the Anti/Oxi Cleansing Oil is pitted against two competitors and put to the test! It’s really cool! The Shu Uemura Anti/Oxi Cleansing Oil is an emulsifying cleansing oil, so all you need is to pump a few pumps of it, add water to emulsify (it will turn a milky white) before massaging it gently all over your face and rinsing thoroughly. 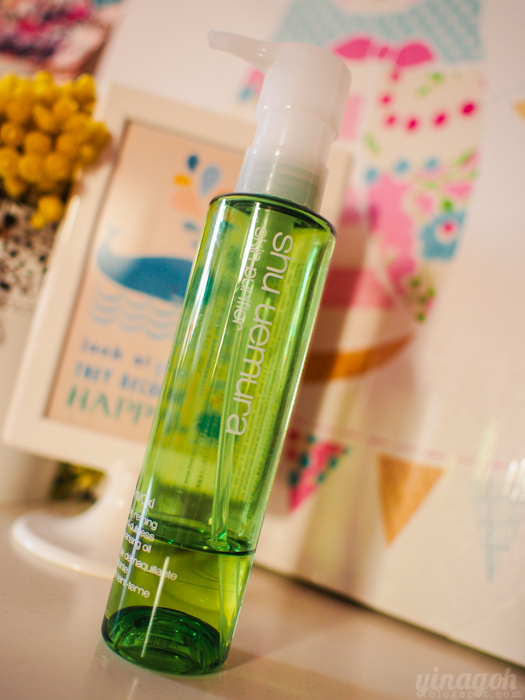 You don’t need to double cleanse with the Shu Uemura Anti/Oxi Cleansing Oil at all. It is amazing how it removes all my makeup so effectively, and leaves my skin feeling baby soft, without feeling dry nor tight at all! I love the scent as well.. It reminds me of lavender and smells really soothing. If you have very heavy eye makeup on though, I recommend using a separate eye makeup remover before the Shu Uemura Anti/Oxi Cleansing Oil, so you don’t have to tug around your eye area too much. I’m not sure if it’s due to the effect of the Shu Uemura Anti/Oxi Cleansing Oil, or my medication, but I find that I’ve been getting less clogged pores, especially on my cheeks! The 150ml bottle retails at $55, while 450ml retails at $125. Hope this review was of help, and happy Sunday to all! Previous Post Grub Bistro at Bishan Park!